Automatically turns electrical load ON at dusk, OFF at dawn. 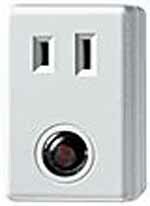 Plugs into any polarized indoor wall socket. Controls indoor devices such as table light, floor light, radio or TV.